From nursing to finger foods, here’s how to nourish your little one’s first 12 months. 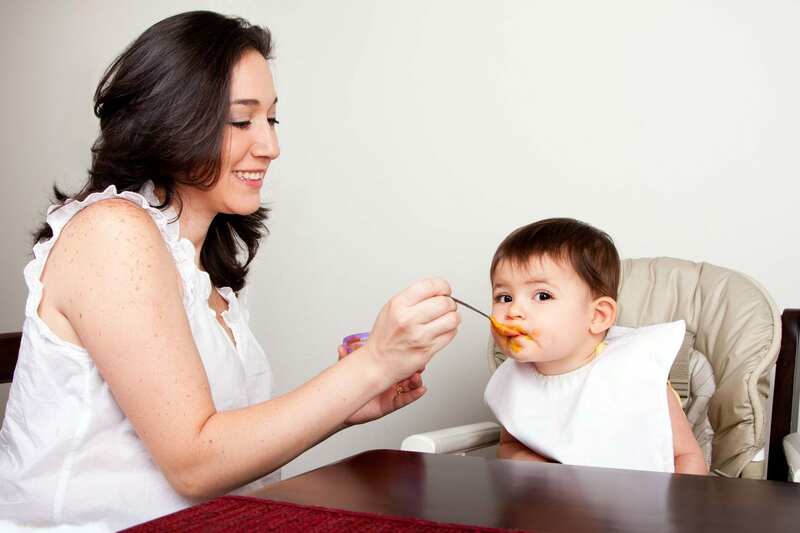 As you settle into a nursing routine, you may be wondering when baby can start to eat other foods. Experts recommend babies be exclusively breastfed during the first 6 months before introducing other foods. The American Academy of Pediatrics recommends breastfeeding for at least baby’s 1st year, and the World Health Organization recommends feeding babies breastmilk for the first 2 years of life. After that, both organizations say moms and babies should continue nursing for as long as they both want to do so. During baby’s first year, breastmilk should always be offered first—then other foods. Since baby only needs a few spoonfuls of these other foods, offer them only after nursing, allowing him to get the full value of breastmilk as his main meal. As baby gets older, it’s natural for him to not nurse for as much or as often. Don’t worry, nursing is still giving your baby valuable nutrition and bonding time. In fact, you may find that your baby who used to nurse every 2-3 hours may taper down to 3-4 times a day. Eventually, you may only nurse during morning and bedtime routines. Take your cues from baby when weaning. Allow him to breastfeed for as long as he wants. There will come a point when he naturally spends less time at the breast. When he’s ready to wean, you can feel good that you’ve given him the healthiest start in life by giving him human milk and the natural closeness and bond that develops through nursing. To begin, gradually replace 1 nursing each day with a bottle or sippy cup of breastmilk. Continue to replace nursing this way, weaning slowly, so that you can gradually decrease your milk supply without engorgement.